I’m getting things ready to post Assignment 4 off to Pat (my tutor) and want to record a couple of things before I forget. This post gets rather heavy towards the end, but I’m sure everyone knows how to click delete or back or whatever if it makes you uncomfortable. In the OCA course we’re encouraged to spend at least 10 minutes a day working in our sketchbook. That turns out to be very challenging! Finding ten minutes of time, energy and an idea to work on is harder than you think – especially after a work day, or when absorbed in project work. Early September I came up with a new strategy – each night plan sketchbook work for the next day, then each morning get up 30 minutes early to do the work. This is working pretty well (except when project work takes over), and that period of focus and purpose sets me up well for the day – a friend has likened it to her morning meditation ritual. Deciding what to work on remained a problem, then a couple of weeks ago I came up with the idea of combining it with my reading. The essential encyclopaedic guide to modern art: styles, schools & movements by Amy Dempsey was recommended to me by Pat in her feedback to my last assignment. It has over a hundred entries, each just a few pages including illustrations, going from Impressionism, Arts and Crafts and Chicago School to Destination Art, DesignArt and Art Photography. For a few weeks now I’ve been reading an entry each evening (I’m such a creature of habit!). I’ve found before that making notes and quick sketches helps me take a bit more time and absorb a bit more information while reading. Under the new regime I read an art history entry, then either choose one of the book illustrations or search around on the internet for a related image. In the morning my sketchbook work is based on that. I’m not trying to reproduce anything, just focus and think a bit better. 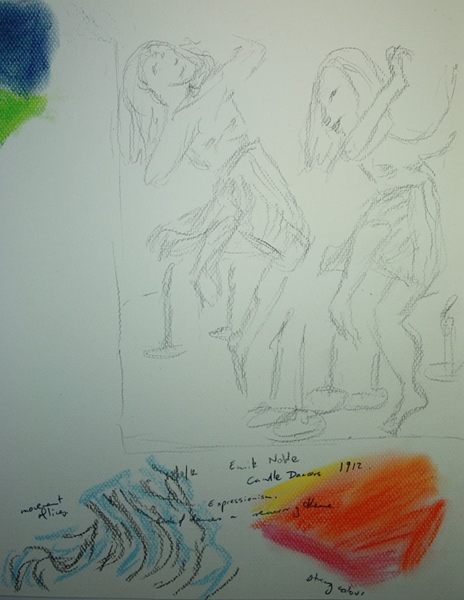 The first photo above was after reading about Expressionism and is based on Emile Nolde’s Candle Dancers. The one on the left is from a work in the Ashcan school – Cafferty by Robert Henri. Really nothing like the original! 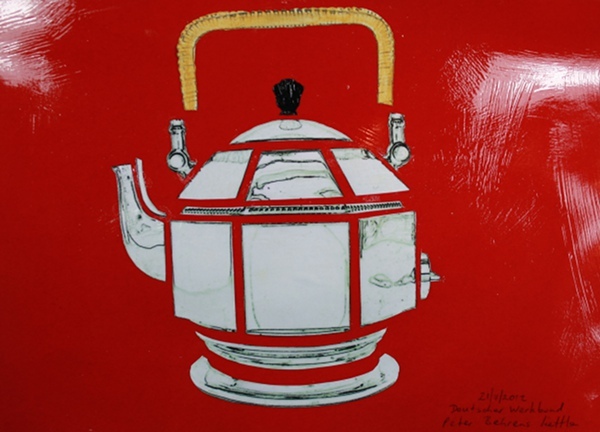 This is a collage using an adjusted photo of a kettle designed by Peter Behrens (Deutscher Werkbund movement). I’ve been trying to vary my approach each day. It’s only been a week or two so far, but it feels that I’m getter better value from both my reading and sketching. All very pleasant and ordered and effective, until Friday when I came face to face with art that felt raw and shocking and visceral and demanding and thumped me about the head until my ears were ringing. The exhibition is Francis Bacon: Five Decades at the NSW Art Gallery. This link takes you to a slide show – the first image (when I just checked) is A study for a figure at the base of a crucifixion 1943-44, and is one … well, it’s actually a totally personal and individual response, because in every screaming face I saw Nancy, the subject or at least focus of my Ageing theme book. Nancy is around 86. A few years ago, after years of pain that medical professionals have been unable to relieve, Nancy attempted suicide. She was put in a psychiatric ward, and has spent the last two and a half years in a high level care nursing home. Her pain has never been relieved. Any mental distress or disturbance she has been experiencing has not been addressed. She used to watch TV, and had a window through which she could see trees and the occasional bird. A few weeks ago Nancy had a medical incident – the family thinks perhaps another stroke, but Nancy is clear that she doesn’t want medical intervention. The last few times I’ve visited the television has been off and Nancy has been lying on her side, her back to the window. She is now totally bedridden and has bedsores on her back and her arms. I asked her what she thought about while she was lying there, hoping perhaps for some lovely memory or moment of redemption or meaning. “How sore my hand is” was the response. We used to chat about my family and hers – she was always interested in the kids. Now after a sentence or two Nancy just shuts her eyes. I feel like an intruder. How can I express such pain in textiles? How can I shout to the world that this is wrong, that we have taken everything, all meaning, from this woman and condemned her to years of torment – all in the name of other people’s beliefs (not Nancy’s) and for fear of harming the vulnerable. Yes, Nancy is vulnerable – and anyone who could look at her and not acknowledge the harm being done to her right now, every moment we force her to continue, is … unspeakable. There is no redemption, there is no meaning, there is no dignity or respect for this individual, there is no hope except for an end. Such a long and dreadful death should not define or dominate Nancy’s life, but neither should we look away and focus on the good and meaningful and loving parts and ignore what is going on. I think there could be another trap, thinking that somehow I could make Nancy’s experience meaningful by trying to use it in some way to promote change. I can’t help Nancy. She is alone and abandoned and I can’t reach her. I’ll visit her this afternoon, as I do each Sunday – and I’ll try to chat or listen or leave early, whatever she wants. I’ll also keep working on my Ageing theme book. I know I won’t be able to express all I’d like to, but I hope I can find a way to express some part of it. My friend and fellow student Claire wrote about this exhibition on her blog – tactualtextiles.wordpress.com/2012/10/25/ruark-lewis-survey-1982-2012-exhibition. I followed her link to the Hazelhurst Gallery, and to cut the story short, we met up last Sunday for an artist talk and performance in the gallery (plus bonus of wandering through the Gymea street fair together). Photos were permitted during the performance, so on the left you get a glimpse of a small part of the exhibition. Ruark talked about the importance of process and pattern in his work. A recurring process has been making, fairly quickly, a series of marks – notations to music, positions of cities, skewed perspective lying in a hospital bed etc. He then refines the marks, meticulously working in graphite or other materials to make thickened lines or visual bars, creating a patterned surface that is not representational but still often captures the original moment or thought. One thing that struck me was the long gestation of ideas and projects. Ruark would talk about conversations and possibilities that could swirl around for years before there was finally the opportunity to create the work – or recreate, with materials being reused and repurposed. I like the sense of awareness of the world and openness. 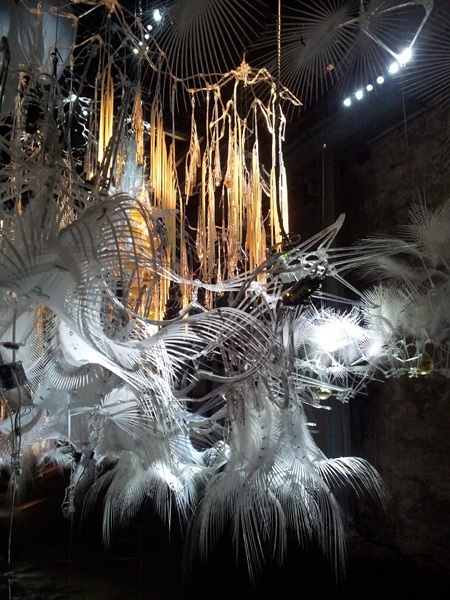 For example the frames in the back of the photo above were used in a previous performance and installation. 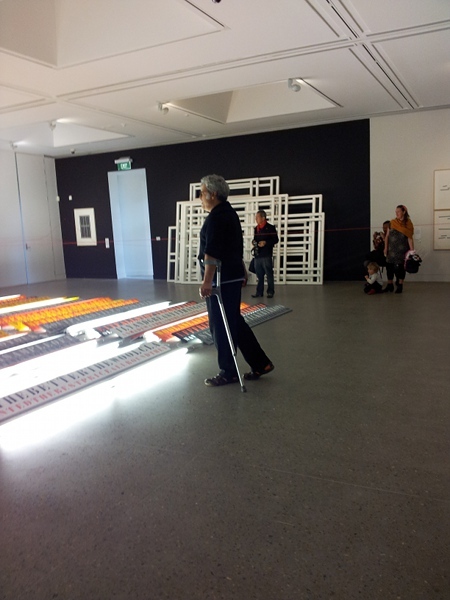 While dismantling the exhibition the packers stacked the frames together – and now, here they are. Ruark’s work often has a philosophical and/or political as well as collaborative element. 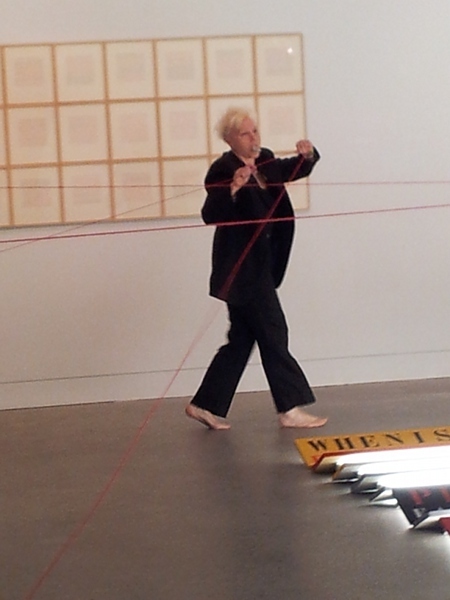 The second photo shows his fellow performer (unfortunately I haven’t been able to find her name), who moved around the gallery creating connections with yarn while Ruark spoke in performance – sometimes quotes from politicians or others (“I’m not a racist but…”), sometimes what I think is called glossalia – a waterfall of non-words and trills and syllables. It seemed to cover a huge range of recent political issues, and there was clearly a plan and structure in what they were doing, but although sympathetic to or sharing many of what I gleaned to be Ruark’s politics, there was just too much I didn’t understand. You probably can’t see in the photo that the performer was holding a shell in her mouth. I missed the significance and was just left bewildered. The work that has remained in my mind was based on points and connections between cities. Thinking of my theme work on ageing and the contraction of space and choice moving from one’s house to a room in a nursing home, I wonder if it would be possible to create two maps, showing the scope of Nancy’s movements over a day pottering around her home and garden, and now virtually bed-bound in the nursing home. 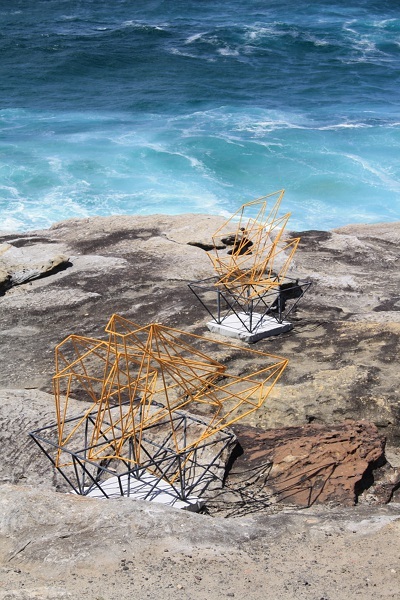 This brings me back to Dion Horstmans’ work which I saw this weekend in sculpture by the sea (blog post 2-Nov-2012). That is obviously in three dimensions, and according to the catalogue “map time and space to reference the landing on earth’s moon”. I don’t know how I could take these ideas into the theme work, how to show the very different scales of movement and also how to make the textile element important. While doing a little research for this post I discovered that some earlier work by Ruark is very relevant. In My Empty House was an installation in 2010 which followed the process of the emptying of a house, a home, due to the ageing and changing needs of the occupants. A very helpful essay by Melissa Laing comments on the importance of the home as a repository, the possessions that help to create and preserve identity. Destructive forces such as ageing can be followed by liberation – but not for Nancy, the focus of my work. Nancy has been denied choice, denied the capacity to act. Yet another line of research I need to follow up. There’s quite a bit of information around at the moment that’s relevant to my theme. Euthanasia and the availability and cost of palliative care are both current topics in State Parliament, with a Dying with Dignity Parliament forum on 19th November (unfortunately clashing with work times). On a personal level Nancy, the initial focus and emotional centre of my work, has been very unwell and we think had another stroke (she has refused medical attention). It seems very possible that Nancy will die while I am working on this theme for the final Assignment. I rather dread the thought, but I would not delay her liberation for a moment. It’s now over three years since she was forcibly denied her right to die. I will be sad for myself, but so very happy for her when the time finally comes. 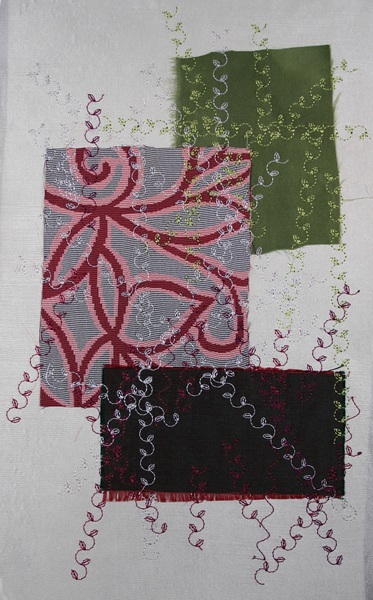 I spent today in an ATASDA “Textile Taster” with tutor Helen MacRitchie (blog http://fibrenell.blogspot.com.au/). I did a two day class with Helen last year, making a bag (blog posts 12-June-2012 and 30-June-2012), but being a Taster this wasn’t about a particular finished product, but a speed tour of heaps of different techniques and ideas. I had camera failure at the workshop (actually multiple operator errors – the camera remained at home and the phone battery was flat! 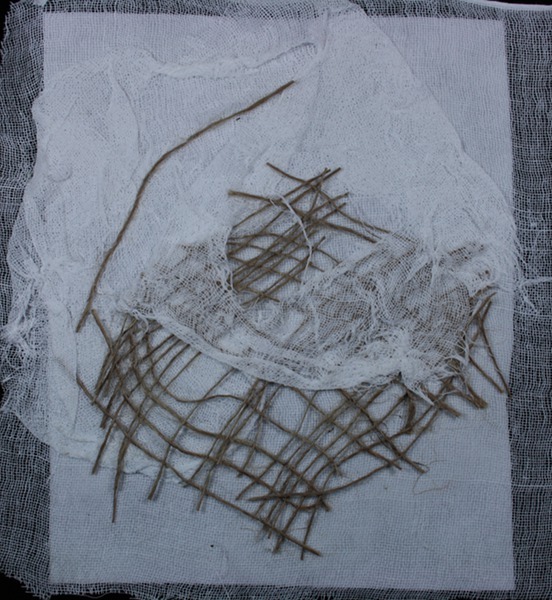 ), so the photo on the left of Helen’s work is taken from her blog (with permission) – see her post here for lots of information about the multiple materials and processes she combined to produce an integrated final result. Helen has completed a City & Guilds Certificate in stitched textiles and is currently completing her Diploma (I felt rather daunted just now when I saw her work on woven structures using paper strips here). The photo on the right is of Helen’s work, a sample for today. 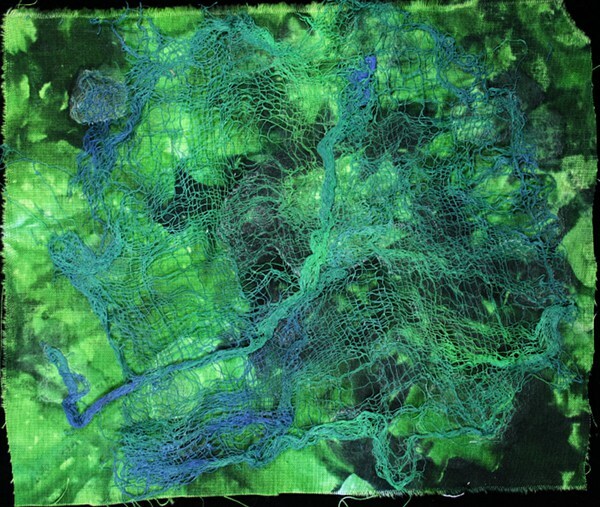 The topic was layers of texture – blending texture through paint, fabric and stitch. We looked at lots of different ways to create textural elements which can be layered and combined to create a work with depth (visual and physical) and coherent design. A particular focus was how to visually disguise the borders between all the parts to avoid jarring and create a flowing whole. Shape, material and colour can be repeated in different combinations at different scales in all the individual elements to assist in bringing it together. Helen started by showing us lots of samples and giving a general overview. Throughout the day she gave demonstrations and led discussions, and we all attempted to try at least a little of everything. As usual I was slow and didn’t get through it all. 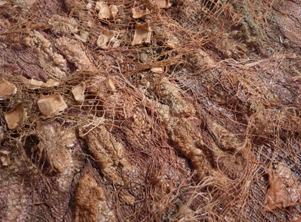 First up was a base of pelmet vilene, covered with texture – in this instance cotton and jute scrims, torn and distorted. We used a dilute, matt, clear-drying ??? gel medium I think. Like everything else we did, this just scratched the surface of possibilities such as adding colour with paints and dyes, and/or using one or more of a huge variety of gels, pastes and mediums. My second background is a hand-dyed cotton base (from a class I did with Djanne Cevaal years ago), with some dyed cotton scrim in the little pack of materials from Helen. We also used the gels etc to make some elements that could be added later in a layer. This is some cotton plasterers’ scrim strip with a matt heavy structure medium stencilled on (through a paper doiley). This could be painted or distorted later. 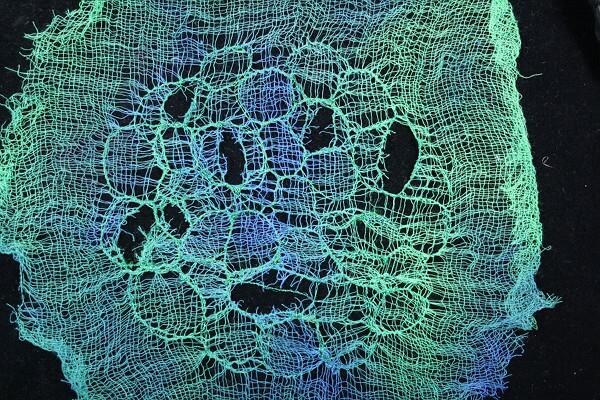 In avoiding jarring effects we can’t make boundaries disappear, but we can help the eye move smoothly across by providing links that blur the edges, using colour and to a lesser extent shapes.This is a poor example, but the idea is to stitch in a thread colour closely matching each fabric piece, effectively bleeding the colour into the surrounding area. One technique I didn’t have time for but really want to remember was the use of whip stitching. If I had just that top green square on the cream background, I would whip stitch on the green using a green thread in the needle and cream thread in the bobbin, producing flecks of cream on the green fabric. Then I would use cream thread in the needle and green in the bobbin on the surround cream fabric, producing flecks of green on the cream. Helen had a green and black sample that was lovely. As well as whip stitch Helen demonstrated cable stitch and using thick threads in the bobbin. I didn’t get to those either. 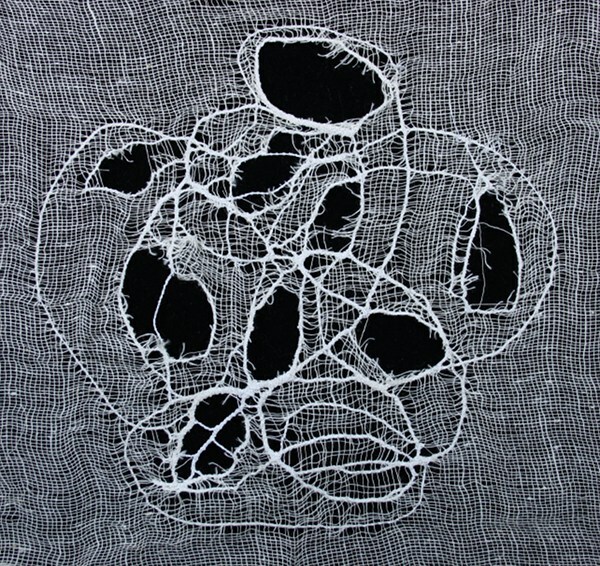 Instead I spent my time on a series of samples of this technique – scrim in a hoop, then stitching over mainly in zigzag, distorting the weave and in places cutting into it. I tried using the regular foot and feed dogs up, and another version doing free motion stitching with feed dogs down. I tried the cotton scrim, the much stiffer plasterers’ scrim strip, and a dyed scrim. I don’t know how yet, but as soon as I saw this I started thinking about my theme book work on ageing – surely this technique would fit in somewhere. Later in the day Helen talked about how she puts all the parts together, and very bravely (I think) actually did a fair bit of work on a sample piece. She had a reference / inspiration photo of some leaf and bark litter in the garden. 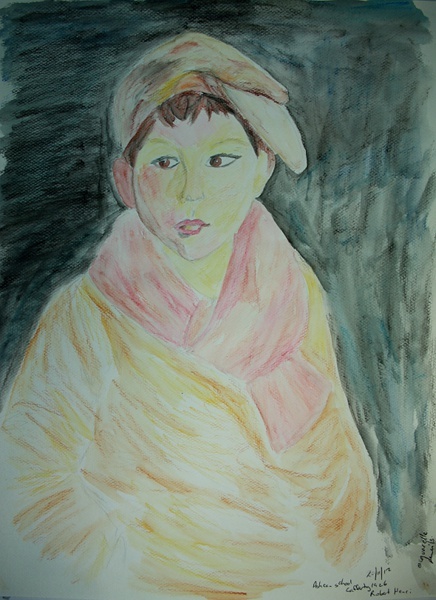 Helen already had a base in suitable textures and colours, plus at least half a dozen separate elements. We discussed how to keep the eye moving around the final work, balance and variety, creating lines but not obvious, continuous ones – the viewer will follow the idea. Helen is very clever in her layering, gradually anchoring things and taking care to overlap in different ways so there’s no clear ordering of the layers. She didn’t have time to get to an end result, but talked about the extra stitching she would do to introduce and extend various colours in areas around the work. On of the things I’m appreciating and enjoying about the OCA work is actually doing the work. It’s very easy to read books, look at blogs, go to galleries, see and talk about things – but nothing beats getting down and doing it. A single day can never be enough, so I’m going to have to make sure to find or create opportunities to practice all of this, because I’m certain that my work will improve if I can incorporate even part of what Helen shared today.